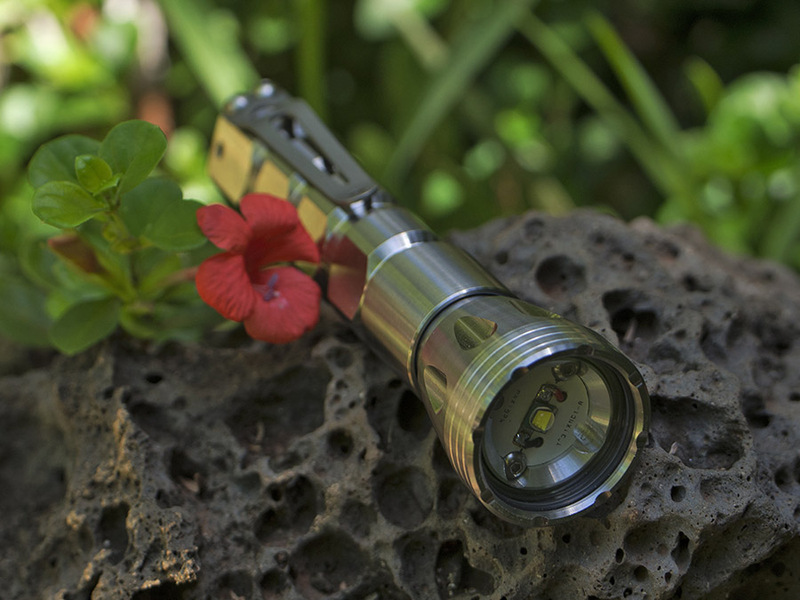 The Mule has a significant aluminum heat sink that threads via a 1"x20 thread into the head of the light. The Ram has a reflector that has the same 1"x20 thread and it also threads into the head and clamps the MCPCB down against a retaining shoulder. A primary design goal for these lights has been a goal I have had now for a number of years and that is for a light (or light platform) that could be taken under water without a second thought. I think it's obvious that previous lights I have made provide the foundation for this new light. 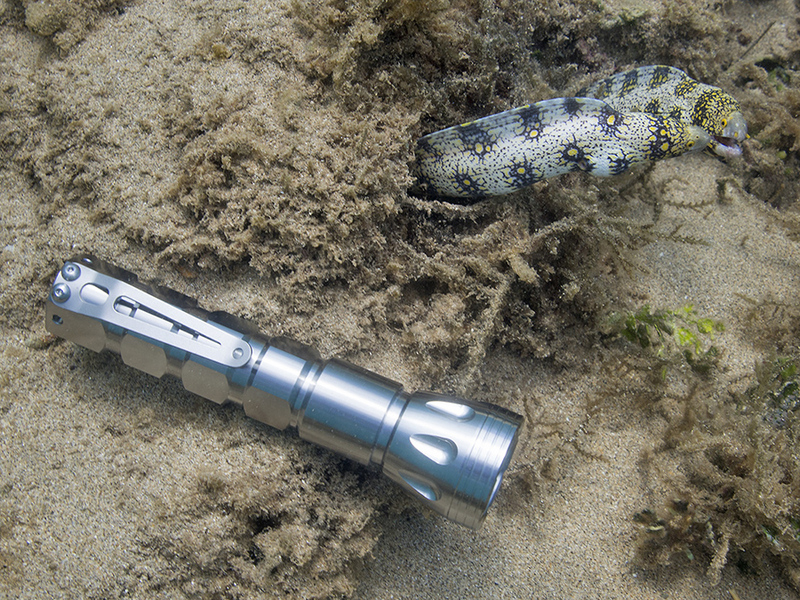 At one point I had a few titanium twisty lights that I wouldn't hesitate to take underwater but I let some CPF friends talk me out of them. 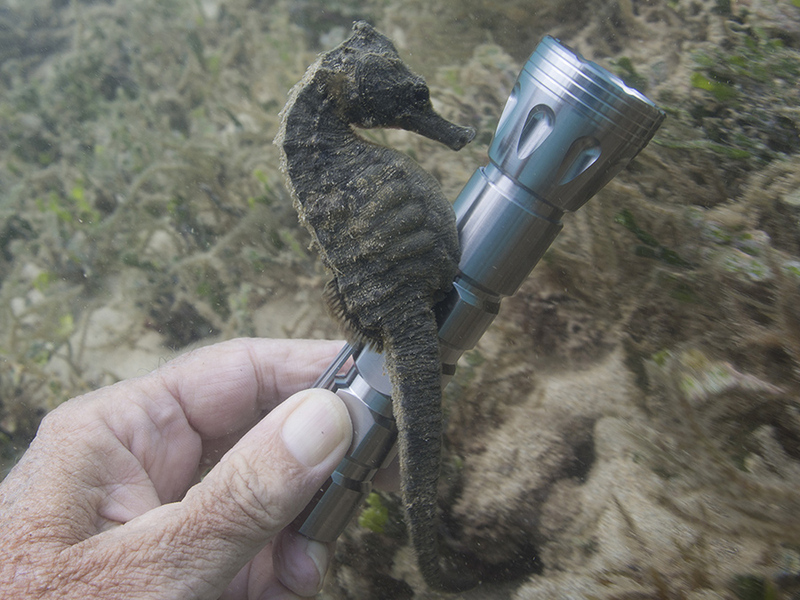 From that point on I planned to come up with a new design so I could at least have my own "dive" light as well as make them available to others who wanted one. All of my designs are based on keeping the water and environment out and I have taken many of them underwater without a problem. However their design was not what I would consider optimal in terms of preventing water under pressure from entering inside. 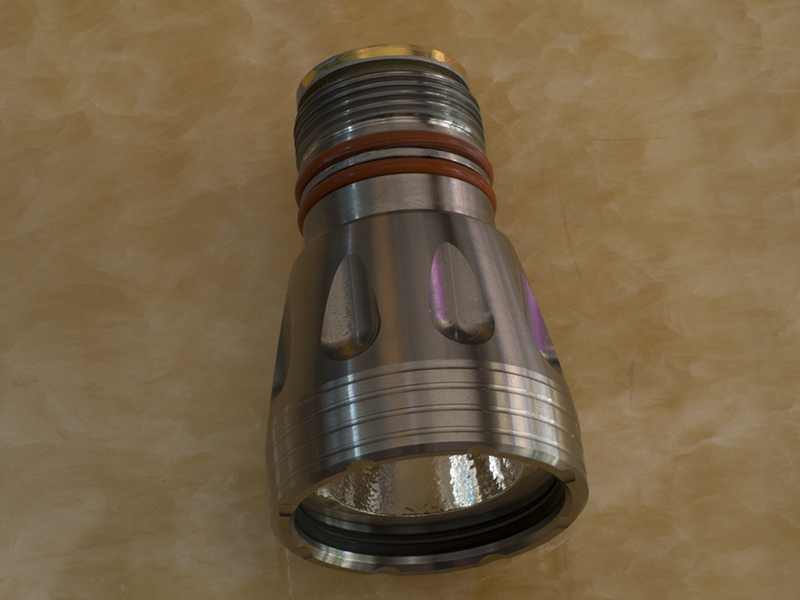 Another design goal was for this light to be my first light designed specifically to host an 18650 Li-Ion battery. This required leaving the 13/16" x 20 thread mating of head to battery pak which has been the platform for most of my other lights. I increased the thread diameter to 7/8" which allows for the larger diameter of the 18650 cells as well as sufficient wall thickness in the body and head parts. 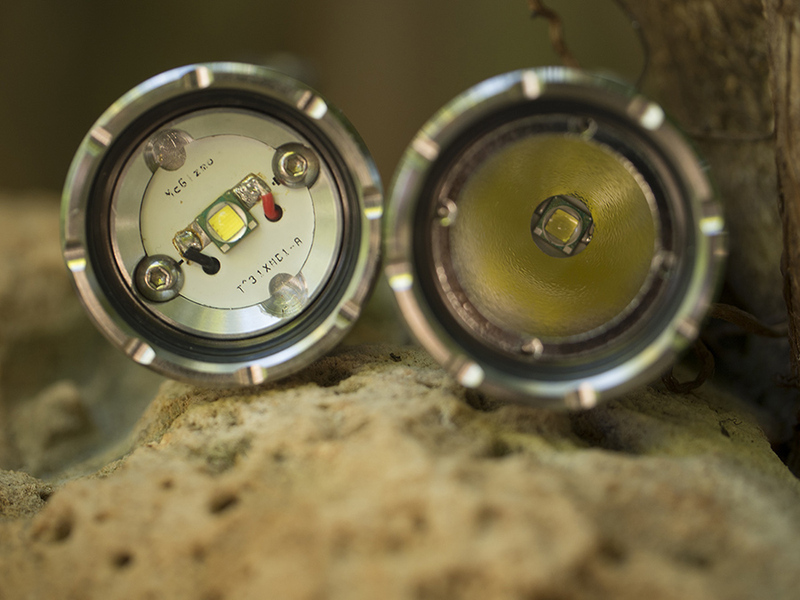 Given the power available from an 18650 I was also able to increase the power to the LED over previous lights of mine. And given the capacity of current LED's, the time for me to do so is certainly now ripe. 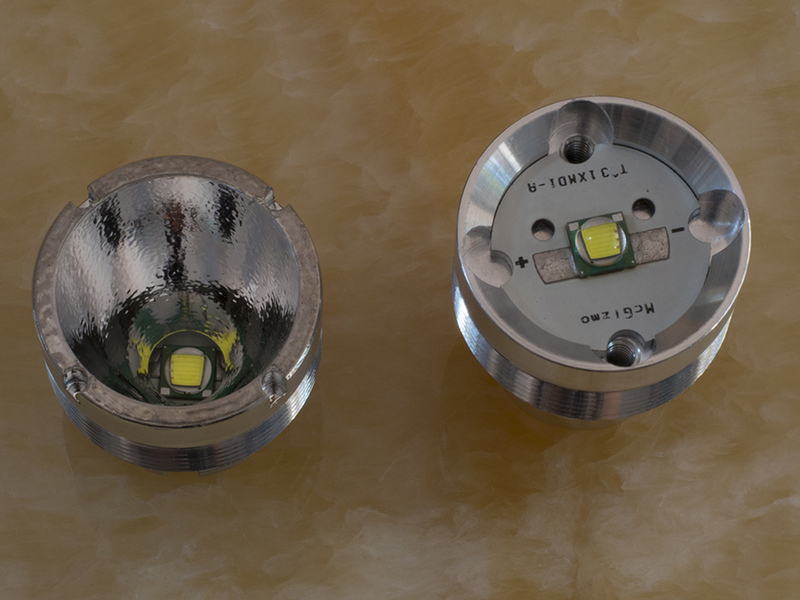 I also believe the increase in aluminum and titanium material in these lights supports the thermal considerations of driving the LED at a higher current. 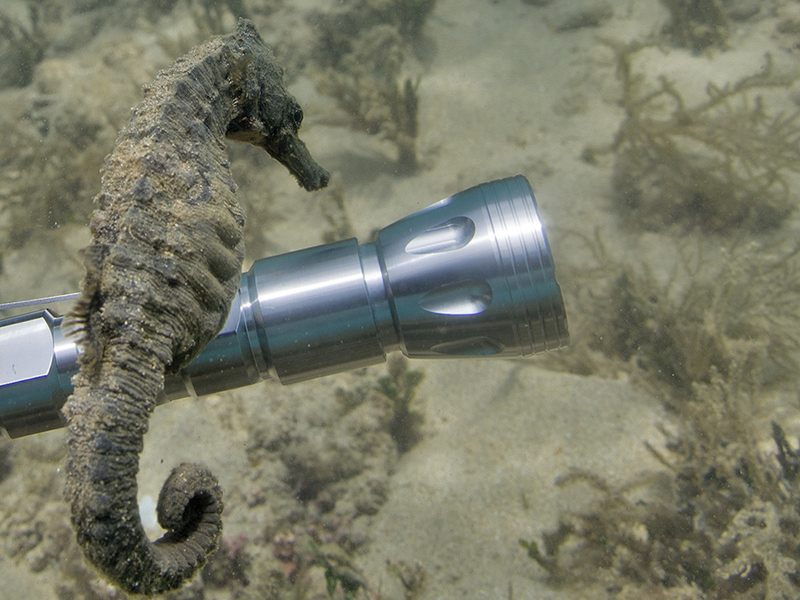 The light is activated by twisting the head all the way down until a gold plated brass contact ring (similar in function to the PD lights) makes contact with a shoulder in the battery pak. The two O-rings provide a seal for the light and either one on its own would be adequate in providing such a seal. I consider the outboard O-ring to be more of a seal to keep dust and debris out and as guard protecting the inboard seal which for the most part would see no duty. Although identical in outward appearance, the AquaMule and AquaRam are quite different where it counts. The AquaMule provides a wide exit for the LED and its flood beam is greater in angle than the other Mules I have offered. 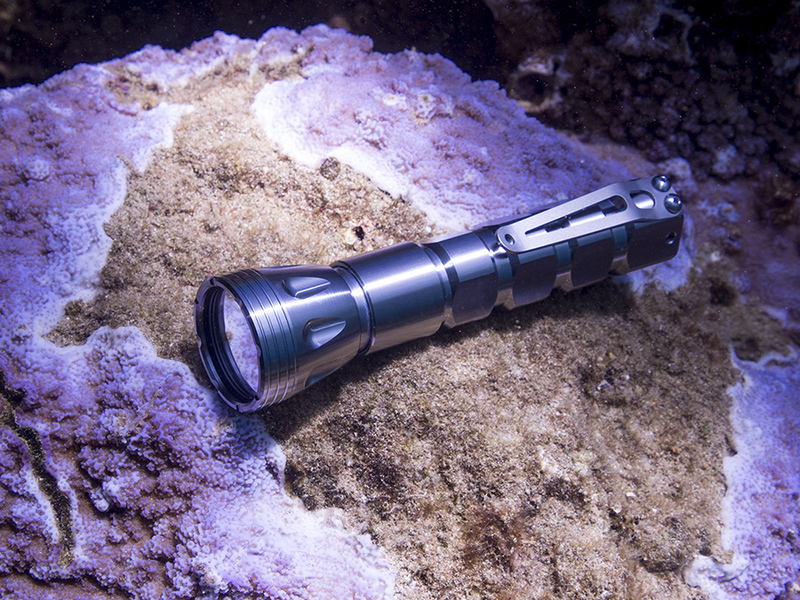 I found I really wanted such a beam pattern when I started playing with a GoPro at night under water and in fact a modified 27LT into a under water Mule is what finally got me to commit to getting these lights designed. But there are also times when you want intensity you can only get by collimating the light and I knew I wanted this design to support a reflector as well. The Aqua Ram was the result. As most of you know there is one critical and key component in all of my lights that is simply beyond my ken and that is the converter. I can design its physical size and electrical contacts as well as provide a wish list for its output and UI but the actual circuit design is something I must seek from an expert. In the case of the Aqua line, as luck would have it, a fellow CPF member contacted me about some of his converter designs about the same time I was getting serious about moving forward with these lights. He goes by the forum name of Rush but I have come to know him as Martin. It has been a real pleasure communicating with him for these many months and he has come up with a converter that exceeds my needs and wants and one that may well satisfy some of you, beyond my expectations. HERE is a separate thread that will be available for you and he to discuss the potential customizing of his converter beyond the stock version that I will be providing with these lights. As for the stock converter let me provide some details. It is a four level output with a short off duration required for level shift. Same UI as my McClickie 3 speed lights but activation is accomplished with a quick twist off and then back on. I was initially concerned about how well the UI would work with twist activation but it's really straight forward and simple. Now I don't know if those saw tooth drops there starting at about 80 minutes were due to thermal protection of the converter or due to the throttling down of the converter due to voltage drop in the depleting cell. Martin has included some features in this converter to protect it as well as help the user avoid a sudden black out due to depleted battery. 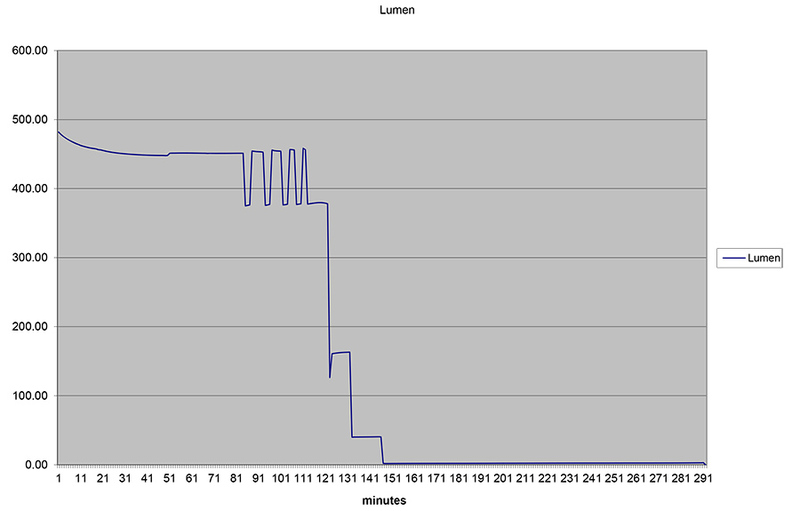 In the graph above as well as the performance table below, the lumen measure is reasonable but not exact. I believe the numbers are well within what one might expect from one of these lights but my integrating sphere is incapable of properly accepting the Aqua Head for measure as it sits outside of the sphere with light loss a certainty. The Mule measures are no doubt low relative to the Ram measures for this reason. I have no doubt failed to provide all the information I had intended to but I can always add to the information as well as answer questions later on. Let me get to the offering itself. At present I am offering a XM-L2 based AquaMule or AquaRam for the same price, $575, plus postage. If you want one of these please so indicate in the subject line of your e-mail request as well as provide your mailing address in the body of your e-mail request. Please be familiar with my ordering process and other details as mentioned in the Available lights, pricing and order info thread. I think it's obvious that the AquaMule and even the AquaRam to some extent can be host to other LED's and indeed can be a platform for future modifications. I am using Loc-Tite blue on the Mule Heat Sink as well as Ram reflector but that should not preclude their removal at some future date should the need arise. There are a number of areas on the light and battery pak where milled slots could be added for tritium hosting but that is totally up to the user and not something I am offering; the same for various surface finishes. Thanks for your interest and continued support these years! 3-17-14: TerraMule and TerraRam added to the line. Hi guys, I am now adding a clickie pak to the AquaRam and AquaMule offering which for obvious reasons will be called the Terra pak. These lights are thus now available as a TerraRam and TerraMule as well. The price on the Terras is $590 plus postage. To be clear, the same heads will interchange on the Aqua pak or Terra Pak giving you a submersible twisty version or a land based clickie version. The clickie version has the same weather proof ability as the rest of my clickie line and should weather a dunking with no issue provided seals and boot are in proper functioning order. Congrats Don. Will send you an email next week. Thank God, it's fall here in Greece. Don, could you show the tail? Are there holes for cord? Looks great Don! I too would be interested in seeing the tail end of the light. And to answer a question that has already come up, the XM-L2 LED's I am using are U2 1C bin. These are the brightest LED's I could get and their tint is a cool white but not blue to my eyes. Wow. Looks bomb proof!! A chunky Ti twisty. Nice!! And, continued good luck with all your lighting endeavors. Don. On the initial power up (first contact), does it start from High, Low or memory? Will this battery pak host a PD head? ISO --> any vintage, cross-hair logo Surefire; Ku's SWM V-series 18500 tubes; PM me if you have a SPY007 XM-L2 SWGG for trade! First of all i want to thank you Don for the opportunity of working on the Aqua lights together, i am delighted that my driver sees its first light at the heart of this creation. Its been an absolute pleasure to do this with you! Don has already provided a lot of details about the UI and features of the driver in the stock configuration. The UI is not unlike the well known 3S driver, except for the 4 output levels instead of 3. You step through the output levels from lowest to highest by a short off duration of up to 0.5 seconds. It does have level memory, so it always comes on in last used output level. In addition to the UI part, the driver also provides some features to keep the light running safely and without any sudden shutdown. The driver monitors the board temperature and the battery voltage. This is what you can see in the lumens vs. runtime graph in Dons post above. The output drops on the highest output level are the result of the driver reducing the output until the light has cooled down enough. However this will only happen after a longer time on the highest output level of approx. 1400 mA. When the battery is fairly depleted, the driver will step the output down through the lower output levels. The amount of reduction is dependent on how far the battery is depleted. On the lowest level you still have ample runtime to finish what you are doing without ending up in the dark. After having been able to test and admire one of the Aqua lights for a while now, i have to say that they are yet another great McGizmo design. 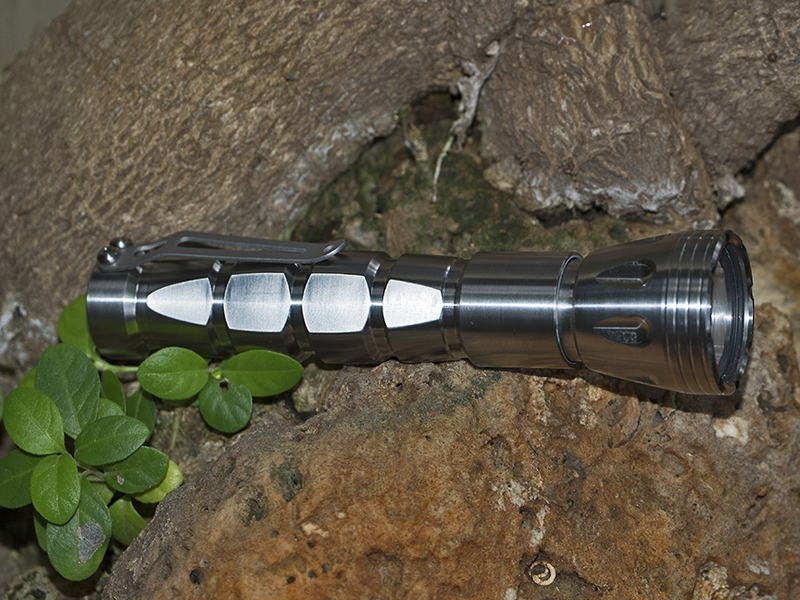 The light feels great in the hand, is well balanced in weight and the twisting is smooth. Will the customisation of the driver (tweeking) be doable at the user end, or is this a proper mod requiring soldering and whatnot? So any old Joe can reprogram this driver? Or do we need special tools?? 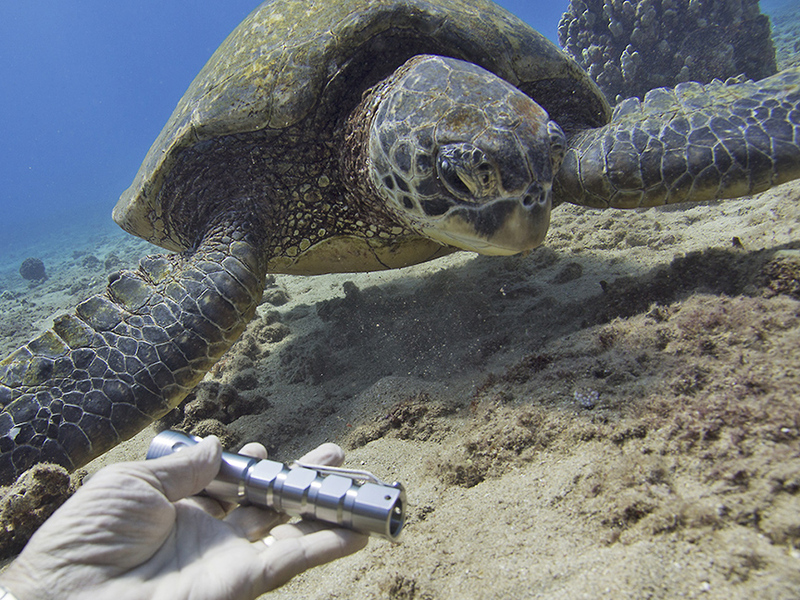 Oh, and E-mail sent for one AquaRam with XM-L2!!! We are all expecting a drooling report from you. Very nice! This has been a long time coming. 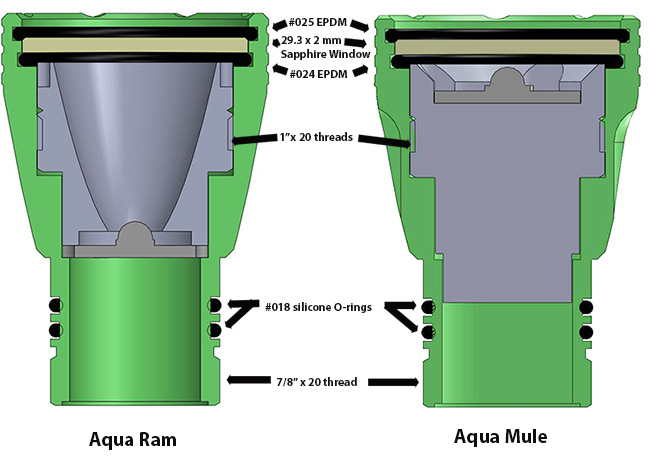 I would love to see pics of the beam profile for the AquaRam. Still love the 27LT design. Nice work, Don! Email sent for one AquaMule. In order to properly digest an 18650 the bore of the battery tube is larger than the E-series or PD series 13/16" x20 thread system could accommodate. That's why I bumped up to 7/8" x 20. 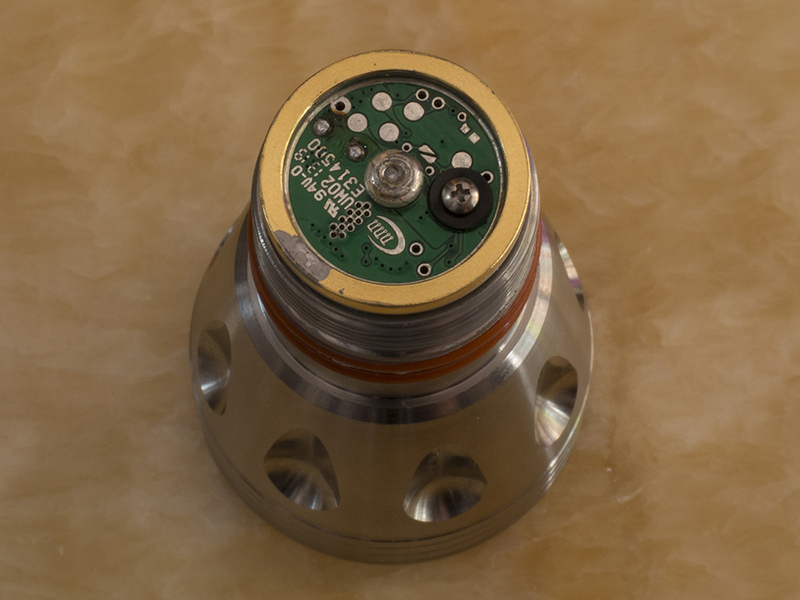 The PCB and contact ring are both larger in diameter than the PD series as well and this was important to allow Martin more real estate for the converter components. I should mention that the bore diameter for the battery chamber is 18.8 mm so it should handle any 18650 that is even close to resembling an 18650 cell in terms of diameter. I plan to leave the custom programming and modifications to UI to Martin and the thread dedicated to it but should mention here at least how one opens the door to customizing. Martin had the door open initially but my concern was that someone not at all interested in accidentally entering would not enter by accident. For some of us, we want the light to work as we expect it to and don't want to inadvertently enter a mode unexpectedly where we need to perform certain functions in a certain sequence. Martin was able to comply with my wish that a jumper pad be included on the PCB where one would have to solder across the jumper pads in order to open the door to programming the converter. My intent at this point is to deliver the light to you guys with that jumper gap open and the door to programming closed. There is a fair amount of potential for you guys to modify these lights both physically and operationally but I leave these modifications to you and I don't offer support in any such endeavors. Enter at your own risk. So if we have already placed a order, can you close the gap for us or no? Will wait for Martin to reply in the other thread. EDIT: Never mind Don, after reading the manual posted by Martin, looks like its just a tiny lil blob od solder to close that gap. Even I can do that, LOL! Last edited by PoliceScannerMan; 10-16-2013 at 12:43 PM. We agreed to go this route to make sure that no unsuspecting user would get into the setup and possibly mess up the configuration of the driver. The way the toggle sequence for entering the setup is chosen, i find that it rarely happens to me that i call the setup by mistake. It can happen however. If you know about this then all it takes is a few toggles (= level switching) to get out of the setup again without changing anything. Shipping notice received and PayPal sent!!! What is the head outer diameter?